WSU Transportation Services wants to help you get where you want to be for WSU events. To find out more about event parking, just click on the link for the event you will be attending below. If the event you are attending is not one of the links, please feel free to contact us with questions regarding parking for the event. Parking information during res. hall Move-In.. Follow this link for parking information for persons with disabilities . Convenient parking for events at the Beasley Performing Arts Coliseum will depend on when the event is taking place. If the event or concert is occurring during other major events (such as football, Mom’s Weekend, etc.) we will post event parking information in the News and Events section of our home page. We encourage you to contact us if you have any questions on event parking. Convenient parking for events at the Beasley Performing Arts Coliseum will depend on when the event is taking place. If the event or concert is occurring during other major events (such as football, Mom’s Weekend, etc.) we will post event parking information in the News and Events section of our home page. We encourage you to contact us if you have any questions on event parking. Click here for Athletic Event parking. For event parking during the day, please obtain a parking permit from Transportation Services or the Brelsford WSU Visitor Center . For evening and weekend event parking, many parking areas near Beasley Coliseum do not require parking permits after 5pm. Please refer to the signs at the entrance to the parking lots to determine if permits are required. Disability event parking is provided in the lot adjacent to the north side of Beasley Coliseum, North Fairway Road directly south of Beasley Coliseum and in the northern bay of the Yellow 1 lot south of Beasley Coliseum. 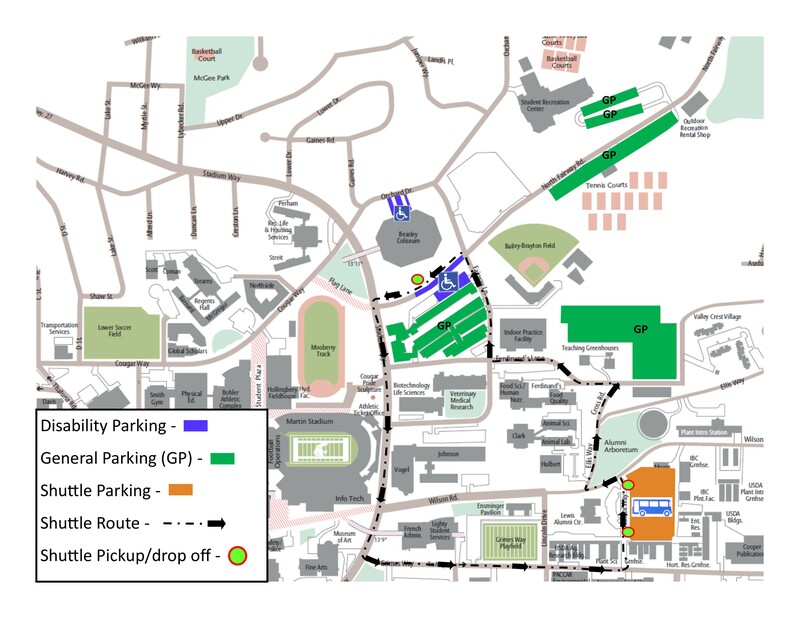 Follow this link for the Commencement Disability Parking Map. Convenient parking for the CUB can be found in the Smith Center or Library parking garages. Hourly parking is available during the day; flat rates are available evenings and weekends. Follow this link for more information on garage rates. Simply take either garage elevator up to the Glenn Terrell Mall to access the CUB. Events section of our home page. We encourage you to contact us if you have any questions on event parking. For evening and weekend CUB parking, many parking areas within walking distance of the CUB do not require parking permits or payment during weekend and evening hours. Please refer to the signs at the entrance to the parking lots and the times of enforcement on the meters to determine if permits or meter payment is required. Visitor Parking Information is available at the Brelsford WSU Visitor Center or at the Transportation Services Building. For Museum of Art event parking during the day, please obtain a parking permit from Transportation Services or the Brelsford WSU Visitor Center. in the Fine Arts parking garage. After 5pm this facility is a flat rate for all evening. Please refer to the signs at the entrance to the garage for information on how to make garage payment after 5pm. NOTE: Only Orange 1 permit holders may park in this garage Monday through Friday from 5am to 5pm. Many parking areas within walking distance of the Museum of Art do not require parking permits or payment during weekend and evening hours. Please refer to the signs at the entrance to the parking lots and the times of enforcement on the meters to determine if permits or meter payment is required. Convenient parking for School of Music concert events can be found in the Library or Smith Center parking garages. After 5pm these facilities are a flat rate for all evening. Simply take the garage elevator up to the Glenn Terrell Mall and walk to Bryan or Kimbrough Hall. Follow this link for more information on garage rates. If the event or concert is occurring during other major events (such as football, Mom’s Weekend, etc.) we will post event parking information in the News and Events section of our home page. We encourage you to contact us if you have any questions on event parking. Convenient evening parking for WSU Performing Arts events in the Jones or Wadleigh theatres can be found in the Daggy parking garage. After 5pm this facility is a flat rate for all evening. Please refer to the signs at the entrance to the garage for information on how to make garage payment after 5pm. NOTE: Only the Orange 2 permit holders may park in this garage Monday through Friday from 5am to 5pm. Many parking areas within walking distance of Daggy Hall do not require parking permits after 5pm. Please refer to the signs at the entrance to the parking lots and the times of enforcement on the meters to determine if permits or meter payment is required. Follow this link for the Football Parking Game Plan. WSU officials will establish a temporary “restricted traffic zone” on a section of Stadium Way from Grimes Way north to Orchard Dr./Cougar Way during home football games. Follow this link for more information on the Stadium Way Traffic Revision for Home Football Games. Disability Parking Disability event parking is provided in the lot adjacent to the north side of Beasley Coliseum and the lot east of Beasley Coliseum. Follow this link for the Disability Parking Map. Important: Follow this link to see a map for an Alternate Route to Enter Pullman and the WSU Campus. Use this route to avoid heavy congestion in downtown Pullman. Paid general event parking is available at $10 per vehicle in the parking lot east of the Indoor Practice Facility. Paid general parking is available in the Library garage for $2.00 per hour during the week day, $3.00 all night after 5 PM and $3.00 all day Saturday and $3.00 all day Sunday. General event parking is available, at no charge, South of Johnson Hall 1.5 Hours prior to Tip Off. RV Parking: Follow this link for RV Parking during Home Basketball Games. Improve pedestrian safety and access for large volumes of game patrons crossing Stadium Way to and from Beasley Coliseum. Consolidate the flow of exit traffic from campus side streets and parking areas into more manageable and predictable patterns. Parking for Cougar Athletic Fund members is available in the parking lots nearest Beasley Coliseum. Follow this link to learn how to join the Cougar Athletic Fund. Refer to the parking maps below for more information. General event parking is available in the Yellow 1 Beasley Coliseum south lot. Permit or payment is required during posted times. Please pay attention to the signs at the entrances to the lots for permit requirements.Paid general parking is available in the Library garage for $2.00 per hour during the week day, $3.00 all night after 5 PM and $3.00 all day Saturday and $3.00 all day Sunday. Paid general parking, up to two hours at a time, is also available at parking meters located in the vicinity of Bohler gym. Payment of the meters is required during the event. Spaces in the Crimson 1 zone are available to Crimson 1 permit holders (i.e. Resident Students) and those with Disability permits. Paid general parking is available in the lot north of the tennis courts. Permit or payment is required during posted times. Please pay attention to the signs at the entrances to the lots for permit requirements.Paid general parking is also available in the Yellow 1 Beasley Coliseum south lot. Permit or payment is required during posted times. Please pay attention to the signs at the entrances to the lots for permit requirements.